For a reasonable price compared to other tracking services, you can also identify prospective clients and influencers who are talking about (or looking for) your services, products or organization. Keyhole.co goes deeper than standard impressions and reach by giving you more insight into demographics and where your potential customers, clients or members are sharing the conversation. 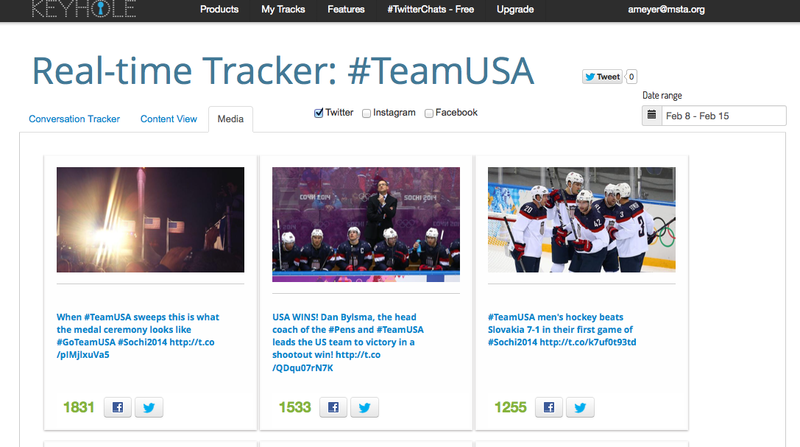 On the dashboard (in this case for #TeamUSA), you can see the conversation, the numbers around tweets, users, reach and impressions. 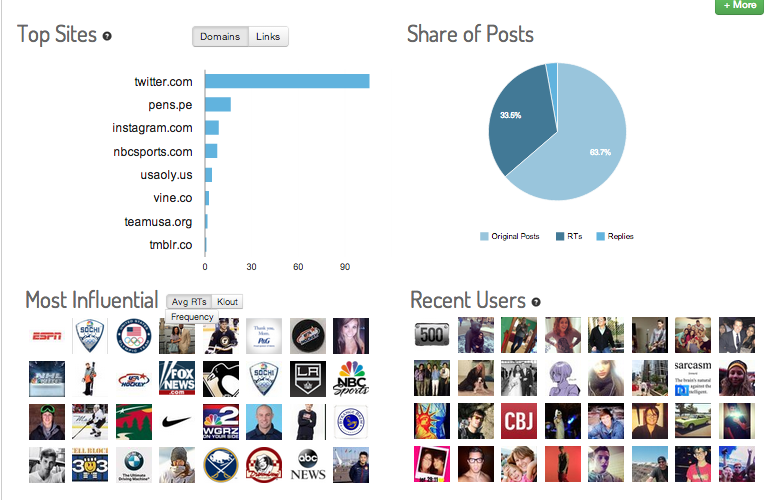 You can see who had the most top posts by retweets, Klout score or most recent tweets for the topic. The Top Sites section allows you to see what domains were mentioned using that hashtag, and what tweets sent traffic there. Share of posts shows the breakdown of original posts, RTs and Replies. Most Influential give you details about who had the most retweets or who has the biggest Klout score, which tells you who talks about the brand or keyword the most. 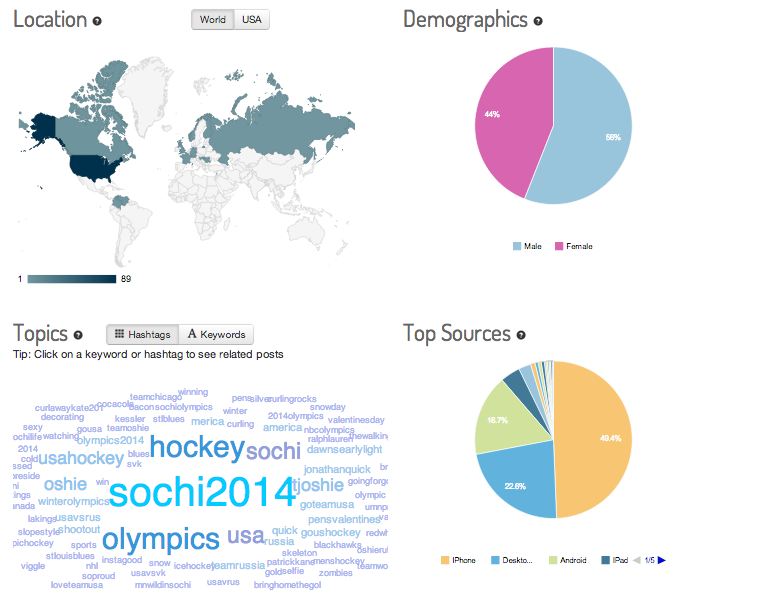 Recent users will show you who tweeted with the topic or hashtag in chronological order. On the next section, you can see the location breakdown (worldwide or just the U.S.) and the gender of those tweeting about the brand or topic. You can also see the breakdown of the top sources for operating system (iOS, Windows or Android), mobile or desktop and browser (IE, Firefox, Chrome, Safari). That’s just the initial dashboard, which is a sample of the conversation at that exact moment in time. Here’s where Keyhole.co really shines. 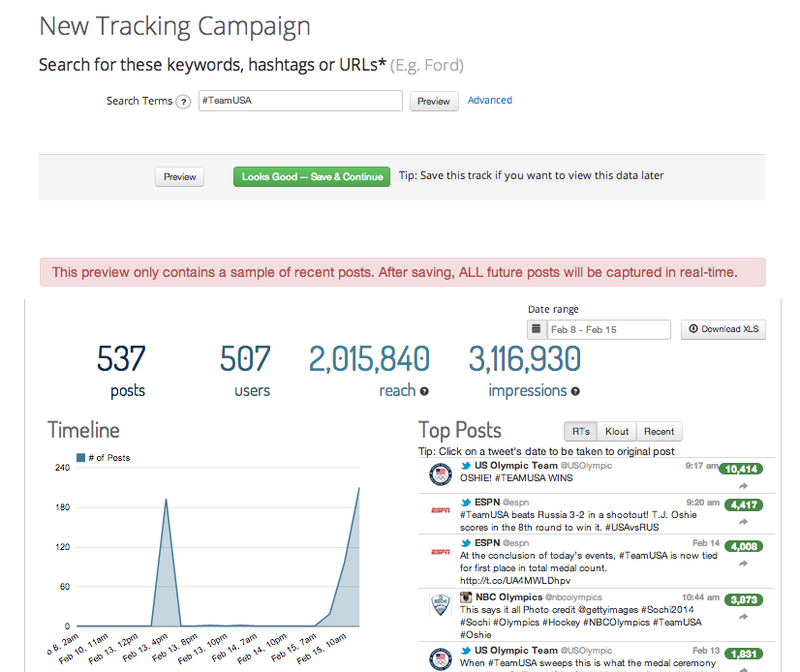 If you want more than just that exact moment, you can set up a tracker for a keyword or hashtag. Once you’ve set up a tracker, all future posts will be captured in real-time and continues running until you change it. You can set a date range up to 30 days (60 is an additional cost). Tracks measure volume and can be used for content discovery – to find the best topical stories in minutes, not hours – and Content View helps make it even easier. With that tab, you can see top stories, keywords, website and influencers for a time frame. You can also view the media shared (photos for example) for a date range. Plus, you don’t have to sign in every time you want an update on the track; you can set it up to be emailed to you. Keyhole.co has recently released a new feature where you can set the exact start and end time for any tracker, which means it will start and stop automatically based on your presets. This is great for Twitter contests. You can read more about this specific feature here. In all, for a general constant monitoring of keywords and hashtags relevant to you that come with great graphs and more details than most other moderately priced services, Keyhole.co is a great option, especially for organizations who want to focus more on conversation and engagement than reach or eyeballs and impressions. As a bonus, Keyhole tracks can be shared with colleagues directly, in case they’re interested in tracking conversations while the event/bill is happening. Just share the URL and they won’t have to login to see the data updating in real-time. Cons: If you forget to start tracking the hashtag (or turn it back on) you lose data. Only tracks 30 days worth of information. Want to try it out? Keyhole.co is offering a free 30-day trial for one PRBC reader. Just Tweet why you deserve to win tagging @keyholeco with the hashtag #PRBCKeyhole Winner will be announced on March 11, 2014. A graduate of the University of Missouri’s Journalism School, Aurora spent several years covering education-related issues in Missouri, Texas and Washington, D.C., before returning to Columbia, MO. She serves as the Online Communications Coordinator for the Missouri State Teachers Association and runs a successful communications and consulting business. Outside of the office, Aurora enjoys running and is training for her seventh half marathon. Her two biggest fans are her husband and cat, but only one of them cheers her on at all the big races.